I always like to know a little something about an author before I sit down and open up his or her book. Today, I have the pleasure of sharing a sneak peek interview with my friend Quina Aragon about her new book, Love Made. It just released last week, and it’s a beautiful way to teach our children about God’s amazing love and creative nature. It’d be a wonderful Valentine’s Day treat to share with your child about the greatest love of all. You can learn more at LoveMadeBook.com. I live in Tampa, Florida, with my husband, Jon, and our 3-year-old daughter, Jael. We serve as small-group leaders at our church, Living Faith Bible Fellowship. I was born in the Philippines and raised in Orlando, Florida, which is where I first heard and believed the good news of Jesus through a friend in high school. Since then, I’ve found that when I’m processing the lessons God is teaching me, it often comes out in poetry. Since the Lord saved me, I’ve written and performed poetry for various events as a ministry to point people to him. I copyedit and write as well. I really enjoy studying and teaching God’s Word, and I’m thankful to sometimes express the overflow of that through creative projects like spoken word videos and now children’s books. What led you to write Love Made? My good friend Nicole happened to be pregnant at the same time as me, so she asked me to write and share a poem about children at her baby shower. I originally told her, “No,” because I didn’t have any poems about that topic. But on the morning of her baby shower, I was spending some time in prayer. 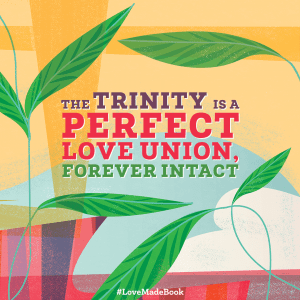 In my prayer, God reminded me of the love union of the Trinity (Father, Son, and Spirit) that existed even before creation, and which overflowed (in a sense) to make creation. Connecting that reality to the joy of parents who welcome a baby into their lives really affected my heart, and out came a poem that I titled “Love Made.” The poem is how I imagined telling my child about the nature of God, the creation story, and how loved she is by God and by her Papa and Mommy. Fast forward a few years, and now this poem has turned into a children’s book that I hope will encourage children, parents, and even those who aren’t parents. This is your first children’s book. How was this process different than other creative projects you’ve worked on? This one was different because I really didn’t imagine myself writing a children’s book as I was writing this poem. I wrote this poem in one sitting right after I finished praying that morning, and I ended up reading it at my friend’s baby shower that same day. Tear-filled men and women approached me afterward to share how the poem affected them. I then decided to pursue creating a colorful animation video for the poem, which my friend Chris Powers from Full of Eyes ministry did for me. So I thought that was that, and I moved on to other projects. But near the end of 2016, when my daughter turned 1 year old, I prayed about possibly looking into writing children’s literature in the new year. Shortly after that, a literary agent reached out to me because he had seen the animation video we did for the poem. That all led to this wonderful opportunity to see my poem turn into a children’s book with Harvest House. As I think of the process of creating this book, I realize that it was really birthed out of prayer pretty much every step of the way. What’s the central message you hope readers will take away from your book? God is, and has always been, love. And out of that love, he created you and me. 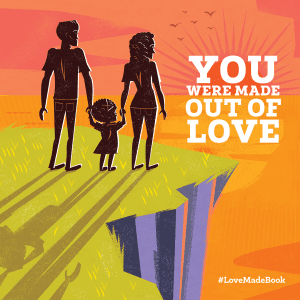 Love made you. No matter the moral failures of your parents, no matter your social standing, no matter what people say about you, God made you out of love. And he made you in his image so that you can partake in the love of the Father, the Son, and the Spirit that has always existed. Only through faith in Jesus, God the Son, can we truly experience and share the deep, deep love of God. I pray that this book helps people long for a deeper fellowship with the God who made them out of love. Writing this book has caused my heart and my lips to praise God with greater joy. He didn’t have to create me, but he lovingly did. God didn’t need to make creation because of some sort of lack in himself. He is self-sufficient and has always existed in a perfect, unified community of love as the Father, the Son, and the Spirit. Yet he graciously chose to make me so that I can know him and get enveloped into that unified community of love through faith in Jesus. I mean, wow! It just makes my heart soar to think about love being the driving force behind creation and salvation (re-creation). This has made me more eager to share the gospel with others, because I want everyone to know and experience the love of God. And it has made me appreciate my precious daughter even more because the inexplicably deep affection I feel for her is just a drop compared to God’s bottomless ocean of love for me in Christ. How did your daughter respond when she found out you were writing a book for children? 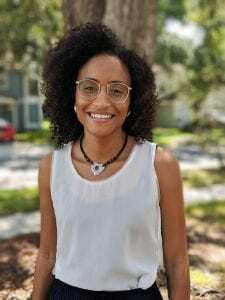 Quina Aragon is an author and spoken word artist who resides in Tampa, Florida, with her husband, Jon, and 3-year-old daughter. Jon and Quina are members of Living Faith Bible Fellowship, where they serve as small-group leaders. Her first children’s book, Love Made: A Story of God’s Overflowing, Creative Heart, released February 5 with Harvest House. Quina’s articles, poems, and spoken word videos have been featured on The Gospel Coalition, Risen Motherhood, Journey Women, and The Witness: BCC. She blogs at her website, QuinaAragon.com, and you can learn more about her book at LoveMadeBook.com.